Those seeking to understand and predict climate change can now use an additional tool to calculate carbon dioxide exchanges on land, according to a recent scientific journal article. The research, published in the Proceedings of the National Academy of Sciences, incorporates into global computer models the significant impact an enzyme, carbonic anhydrase, has on the chemical form of carbon dioxide released from the soil and reduces uncertainties in estimates of CO2 taken up and released in terrestrial ecosystems. The same enzyme is present in foliage and soils, but leaves a different imprint on CO2 involved in photosynthesis and respired by soils. "Our paper presents measurements from all the major regions of the world where we have experimentally determined the effect of this enzyme, produced by many microorganisms, on carbon dioxide released from the soil," said Dr. Behzad Mortazavi, an assistant professor of biological sciences at The University of Alabama, and a co-author of the article. In computer models used to estimate and predict carbon dioxide, or CO2, exchange, scientists had previously incorporated the role this enzyme plays in the vegetation, but had neglected to include its role in soils, according to the collaborative paper written by 18 co-authors from around the world. Revising the computer model predictions to take the soil enzymes' impact on CO2 into account reduces the discrepancies between the model and atmospheric observations, according to the paper whose lead authors are Lisa Wingate and Jérôme Ogée, representing the University of Edinburg and the French National Institute for Agricultural Research, respectively. While scientists had suspected the enzyme was also active in soils, Mortazavi said the impact of the enzymes within soil on CO2 had been difficult to measure and thereby was not factored into the computer models. In order to effectively tackle the complexities regarding human's impact on climate changes, it's important to accurately understand the natural processes, the UA scientist said. "In general, it's very challenging to determine how much carbon is taken up by photosynthesis versus how much carbon is released by respiration," Mortazavi said. "It's important to know the contributions of these two processes because as the climate is warming, the balance between carbon taken up and released on land will change. Warmer temperatures can increase the microbial activity in the soils, leading to a greater release of CO2 from the soil." Ideally, the amount of carbon dioxide removed naturally through the carbon cycle balances the total carbon dioxide emissions. The amount of carbon released into the atmosphere has grown out of balance because of the increased number of human activities such as the use of fossil fuels, many scientists believe. As the world debates what steps should be taken to address human activities believed to contribute to climate change, Mortazavi said it's important the naturally occurring processes are measured accurately, something to which this research will contribute. "This is an additional tool to look separately at the uptake of CO2 by photosynthesis, on the one hand, and, on the other hand, the release of CO2 by respiration." If climate legislation stalls in the U.S. Senate, what then? There are several possibilities. For one, there could be Environmental Protection Agency (EPA) regulation of greenhouse gases under the Clean Air Act (CAA). Last fall, EPA made a greenhouse gas “endangerment” finding and required quantification and reporting of greenhouse gas emissions. EPA is currently working on regulation of GHGs from light-duty vehicles, and then will proceed to regulate greenhouse gases from certain major stationary sources. There is an effort by some in the U.S. Senate to enact legislation to prevent this from happening. In addition to the prospect of EPA regulations, there are active regional, state, and voluntary climate initiatives in the U.S. The primary regional and state initiatives are the Regional Greenhouse Gas Initiative (RGGI) in the northeast, the California Global Warming Solutions Act (AB 32), the Western Climate Initiative (WCI), and the Midwestern Greenhouse Gas Reduction Accord. Voluntary initiatives include the Chicago Climate Exchange, and several other smaller-scale targeted programs in the U.S. There are also very active voluntary programs operating in Europe. RGGI started regulating carbon dioxide emissions from the region's power plants in 2009, has so far raised $494 million in quarterly auctions of permits to emit greenhouse gases. Prices have fallen for three quarterly auctions in a row, to about $2.05 a ton. RGGI aims to stabilize CO2 levels during 2009-2014 and reduce emissions 10 per cent by 2019. AB 32, an economy-wide cap-and-trade scheme that covers about 85 per cent of the California’s greenhouse gas emissions, is scheduled to begin trading on 1 January 2012. AB 32 requires measures to reduce California’s GHG emissions by 174 million tonnes of CO2 equivalent, or 29 per cent, by 2020. California recently issued a draft cap-and-trade regulation that would apply to the state’s largest industrial and electric generating stationary sources. The WCI plans to start trading in the greenhouse gas emissions from power plants and other big emitters in 2012 and expand to cover 90 percent of gases in 2015, when transportation fuels and other sources are included. WCI seeks to reduce GHG emissions 15 per cent below 2005 levels by 2020. The Midwestern initiative is not as far along in the implementation of an emissions cap-and-trade system as RGGI, AB32, and WCI. If federal climate change legislation stalls, these regional and state initiatives, and the voluntary greenhouse gas reduction programs already in existence, are expected to remain active. Scientists at NASA’s Goddard Institute for Space Science found that 2009 was tied as the second hottest year ever recorded. January 2000 to December 2009 was the warmest decade on record. Looking back to 1880, when modern scientific instrumentation became available to monitor temperatures precisely, a clear warming trend is present, although there was a leveling off between the 1940s and 1970s. In the past three decades, the GISS surface temperature record shows an upward trend of about 0.36 degrees F (0.2 degrees C) per decade. 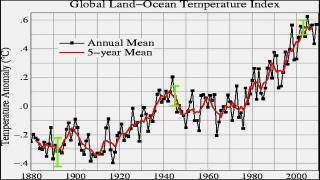 In total, average global temperatures have increased by about 1.5 degrees F (0.8 degrees C) since 1880. The “tracker” compares and consolidates all the national pledges made so far with the scientific goal of getting the world at or under a 2 degree Celsius rise compared to pre-industrial levels. When you go to this web site, click on individual counties on the large map, and it will bring up the pledge of that country.